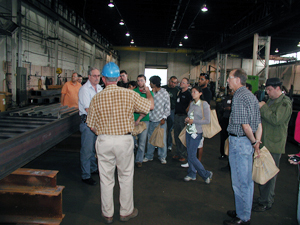 More than 125 architects, engineers, students and contractors visited B&B Welding Company, Inc., in Edgemere, Maryland, as part of the American Institute of Steel Construction's (AISC) SteelDay 2009 event, to see first hand how steel goes from raw material to a fabricated design. Perhaps more important for the structural steel industry was the unveiling of the receipt of material heat numbers, and associated material certifications, through the ASN (Advanced Shipping Notice) by scanning mill applied bar codes. B&B is the first shop in the country to use the software, which catalogs and tracks the barcodes and heat numbers so the shop can keep them on file without using paper. 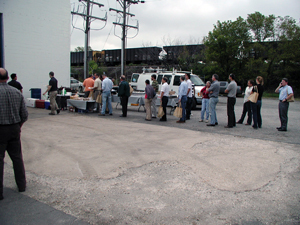 P2 Programs and FabSuite — Interoperability Network partners — were on hand to demonstrate progress made in the seamless transfer of data between all the partners of the steel building delivery team.